From April to September a Minimum of 2 Passengers per booking is required for this excursion. During Low Season (April to October) lunch will be replaced by a Box Lunch which includes an appetizer, main dish, water & cereal bar. Please feel free to inform us if you have any dietary restriction. The departure from your hotel in Puerto Natales will be at 7:00 am to make the first stop at Milodon Cave which is located 24 kilometers north of Puerto Natales. This natural monument is composed by three caverns and a rocky conglomerate called "Silla del Diablo". Before getting to the cave, we will pass by La Silla del Diablo (Devil´s chair), its name comes from the popular imagination that the rock has a chair shape. The oldest men of Patagonia said that in this place the devil appeared to those who came to look for him on the dark nights. 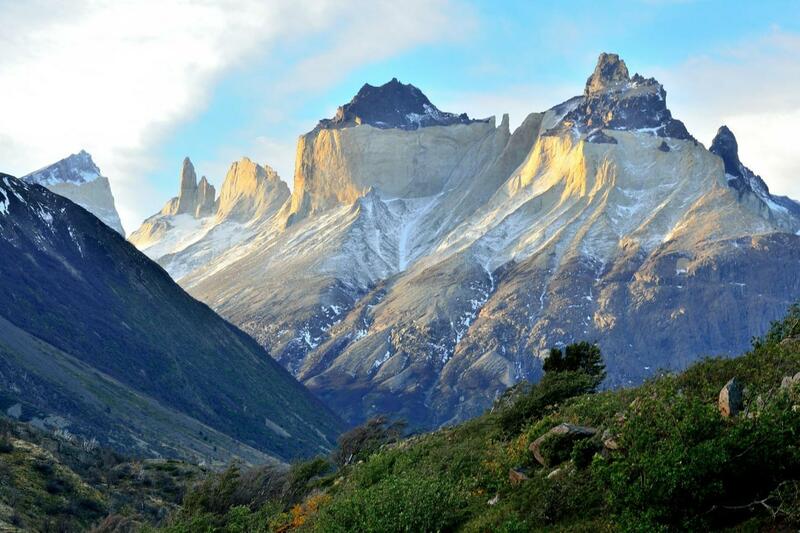 Later on, we will continue our excursion to Torres del Paine National Park. On the way, we can see this stunning massif as well as Sofia Lagoon, Prat Range, Porteño Lake, Mesa Hill, Del Toro Lake, Del Toro and Ballena Hill. Here we can see the beautiful landscape that surrounds us from Grey Lake viewpoint. A couple of kilometers later, we will go over Serrano bridge to continue to Grey lake sector. In this area, we can walk along the shore of Grey lake. If the conditions are good, we can keep walking until Grey viewpoint. When we go back to the parking lot, we will continue our excursion until a restaurant to rest and have lunch (Lunch is not included in our service). Once we are ready, we will begin the second part of our visit in Torres del Paine National Park, heading to Salto Grande sector. We will visit Nordenskjold lake viewpoint and we will continue enjoying the spectacular views of this sinuous route which will approach us to Amarga Lagoon area. Before that, we will visit Paine waterfall which is a beautiful place where we can see the turquoise waters that come from Paine river. After enjoying this pleasant show, we will return to Puerto Natales, but before we will stop at Sarmiento lake viewpoint to take the last picture of Torres del Paine National Park.